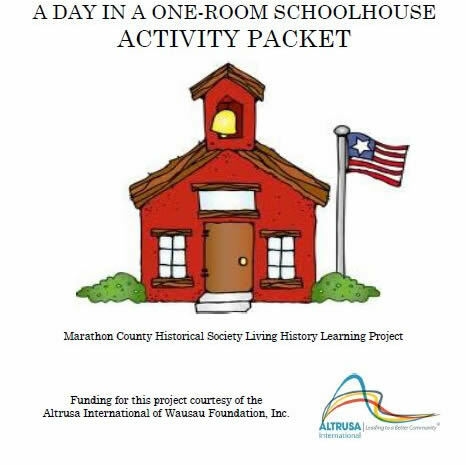 The Marathon County Historical Society, Altrusa International of Wausau Foundation, Inc. and the Marathon County Park Department present the Little Red School House program. This program runs for seven weeks each spring and fall, and is open to all fourth grade students in Marathon County. Spending a day at our school is like taking a step back in time. Let your students find out first hand what school was like at the turn of the century. Classes are held in an actual one-room school house now located in Marathon Park, Wausau. Our experienced teachers will follow lesson plans, play games and discuss topics similar to a typical school day in 1905. All students are encouraged to dress in customes and bring their "lunch pails". Join us for a day of learning and fun. Contact us at (715) 842-5750 for details about the program.